Lou A. McKEE - Welcome to the Writings and Drawings of KLEE WYCK JOURNAL! "Our days pass too quickly. We are always together around the campfire at the end of the day. Tonight's cook offers a giant mess of fresh mussel pasta and a slaw of cabbage and carrot. Then we sing beautiful rounds into the dark night; crystal clear harmony without us even trying." 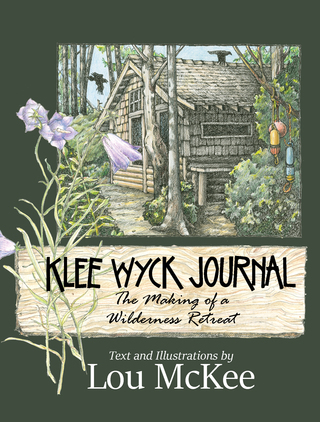 Welcome to the pages of my KLEE WYCK JOURNAL, full of stories of the people and adventures involved in the building of a coastal wilderness shelter hidden among old rain forest firs and cedars and dense salal bush. We reach this remote shore by kayak. There are no roads nor pathways. No docks nor safe buoys. We land on a little sheltered spit in a bay that is otherwise open ocean surf. In time, we forged a trail into the woods to build a cedar cabin to shelter us from the the rain that can drench (and beautify) this sea coast. A summertime community forms, made up of folks from 6 years old to 80. Everyone pitches in to cook, to build fires, to make shakes and cut and carry logs. Some days we put our kayaks in the sea for a day trip to other beautiful places close by. We gather mussels, clams and oysters in secret places. It is a dream that YOU can LIVE by turning the pages of the Klee Wyck Journal. 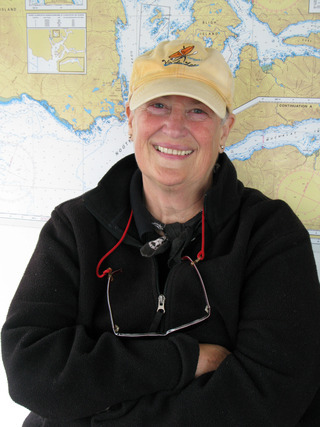 I was born in 1942 in Vancouver, British Columbia, Canada. Childhood summers were spent on Texada Island, where I learned to swim and row a boat at an early age. The sea remained at my toes until, at eighteen, I attended school in Western Washington University's Fine Arts program (1960 – 1964). My life career continued in the visual arts, both fine art and commercially (luckily before the days of computer art) as a: watercolor painter, illustrator, greeting card artist, fabric designer and dinnerware designer, and most recently as an oil pastel painter. Loving the excitement and the calming qualities of the outdoors, I bought an ocean-going kayak at the age of 28. This became the vehicle into that zone. It is the combination of practiced art and love of the sea that brought me to the writing aspect of the arts. With quiet insights and lots of enthusiasm, I offer you this chronicle, KLEE WYCK JOURNAL. "It is a beautiful sunny day for this paddle journey. The ragged blue Vancouver Island mountain range is crisp and clear, in layers, some rounded, some pointed perfectly like a pyramid and some rough and craggy. The dancing waves sparkle, the fresh salty sea aroma wafts into our noses. We move along feeling like the luckiest people on earth." "Waves become rollers, then gale-force winds with white-capped monsters. Wind and waves slam into each other and toss our boats around. It is terrifying. Huge waves come for me, white and frothy on top, like a growling enemy tossing its head, mouth wide open. Adrenalin races through my body, every point on alert." My favorite place to buy books is at my neighborhood bookstore. There is something special about being surrounded by all those words and ideas. Support your local bookstore. You are now on the HOME page. Please click on the WORKS label (top left of this page) to view photos and illustrations and learn more about our adventures.